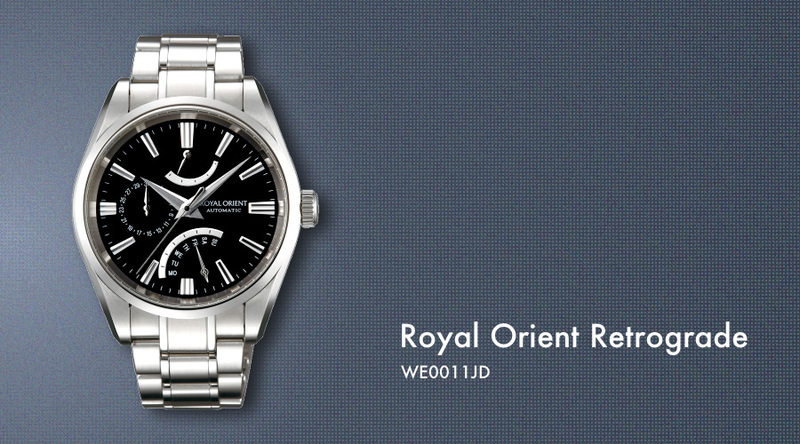 Launched in 1959 the “Royal Orient” brand is the flagship series of the Orient watch in pursuit of “mechanical” watch with a graceful design and exceptional technology that you can keep forever.They are fully hand manufactured by skilled craftsmen at Akita Ugo town watch workshop. Orient has announced in June of 2014 a new watch to its collection, the Royal Orient Retrograde (WE0011JD) that inherits the heritage of mechanical watches, while features a more sophisticated design and specifications. The word “retrograde” literally means a return to the starting point, a unique mechanism makes the hand return to the starting point in an instant, from the Sunday to Monday position, when a week has elapsed. The dial incorporates a highly visible hour and minute hands, which have been cut in peak shape with different finishes on the two sides: matte and mirror finish enhancing visibility (Zaratsu polishing). Along with the retrograde functionality, there is also a power reserve indicator (40 hours) and a calendar in a harmoniously placement. Inside of the beautifully finished case, it’s the caliber 40B50 Royal Orient’s in-house self-winding (made in Japan), which allows hand-winding and hacking. This caliber has a daily accuracy of 10 sec. to -5 sec, 6 beats per second and a power reserve of 40 hours (slightly more according to some reviews). The price tag for this watch is 280,000 yen in Japan, which is about $ 2,570 USD. Although not cheap, this watch is indeed an affordable choice regarding it’s craftsmanship quality and design.